In a cut and cover tunnel, the structure is built inside an excavation and covered over with backfill material when construction of the structure is complete. Cut and cover construction is used when the tunnel profile is shallow and the excavation from the surface is possible, economical, and acceptable. Cut and cover construction is used for underpasses, the approach sections to mined tunnels and for tunnels in flat terrain or where it is advantageous to construct the tunnel at a shallow depth. Two types of construction are employed to build cut and cover tunnels; bottom-up and top-down. These construction types are described in more detail below. Figure is an illustration of cut and cover tunnel bottom-up and top-down construction. 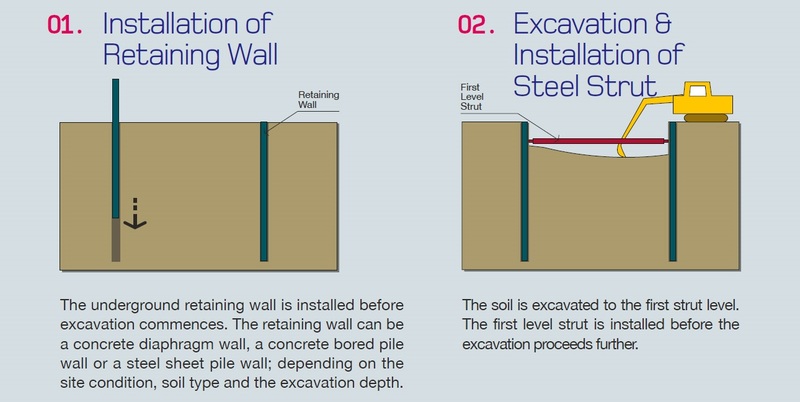 Figure (a) illustrates Bottom-Up Construction where the final structure is independent of the support of excavation walls. 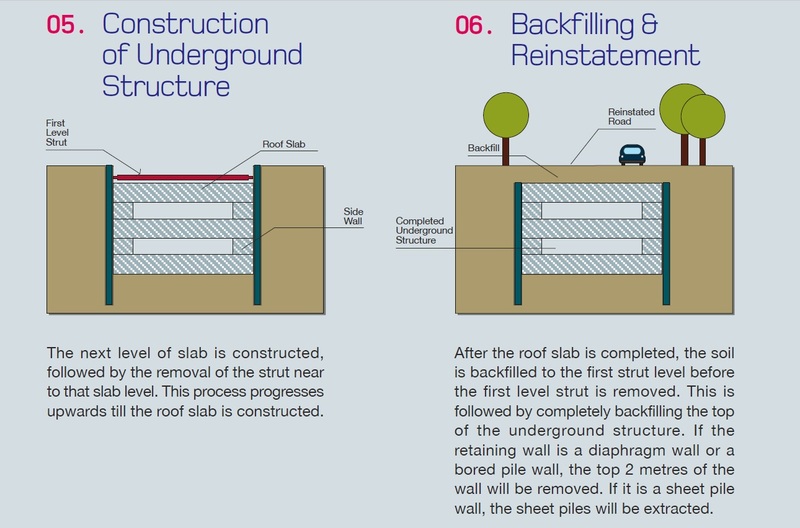 Figure (b) illustrates Top-Down Construction where the tunnel roof and ceiling are structural parts of the support of excavation walls. For depths of 30 to 40 feet (about 10 m to 12 m), cut-and-cover is usually more economical and more practical than mined or bored tunneling. The cut-and-cover tunnel is usually designed as a rigid frame box structure. In urban areas, due to the limited available space, the tunnel is usually constructed within a neat excavation line using braced or tied back excavation supporting walls. Wherever construction space permits, in open areas beyond urban development, it may be more economical to employ open cut construction. Where the tunnel alignment is beneath a city street, the cut-and-cover construction will cause interference with traffic and other urban activities. 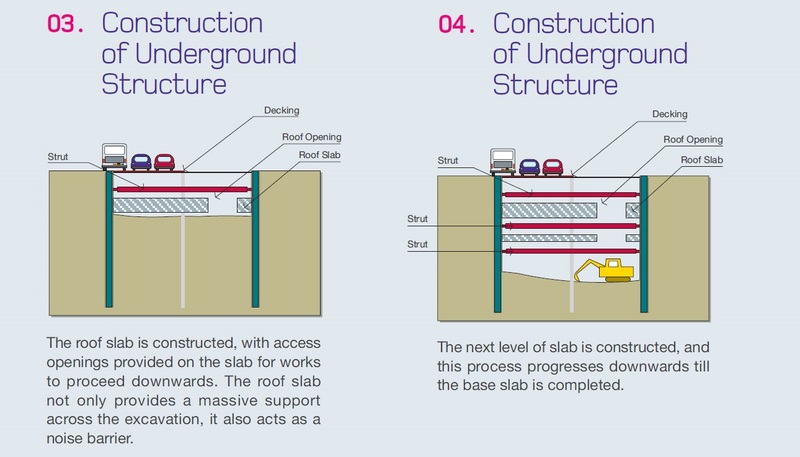 This disruption can be lessened through the use of decking over the excavation to restore traffic. While most cut-and-cover tunnels have a relatively shallow depth to the invert, depths to 60 feet (18 m) are not uncommon; depths rarely exceed 100 feet (30 m). 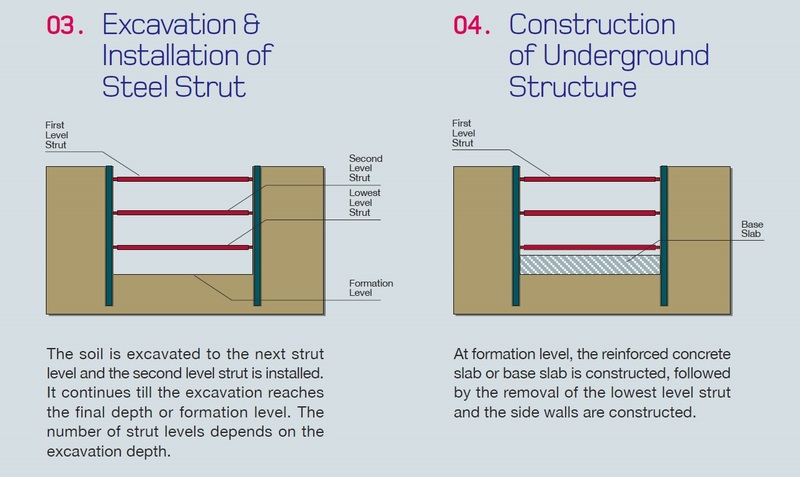 Although the support of excavation is an important aspect of cut and cover construction, the design of support of excavation, unless it is part of the permanent structure, is not covered in this chapter. 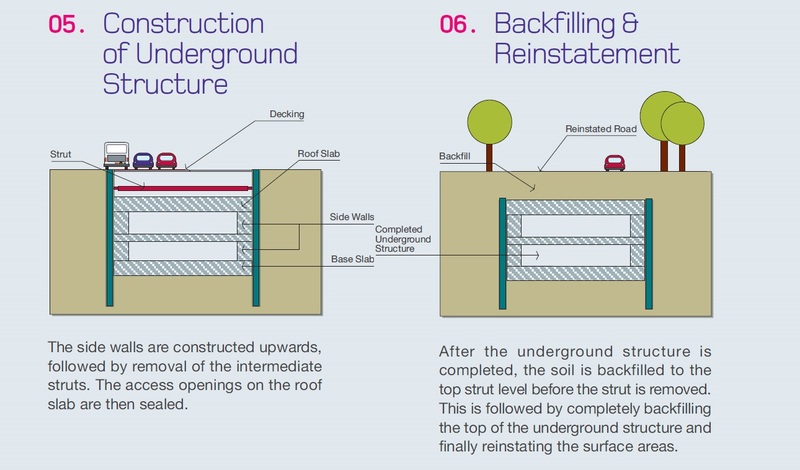 As shown in figure, in the conventional “bottom-up” construction, a trench is excavated from the surface within which the tunnel is constructed and then the trench is backfilled and the surface restored afterward. The trench can be formed using open cut (sides sloped back and unsupported), or with vertical faces using an excavation support system. In bottom-up construction, the tunnel is completed before it is covered up and the surface reinstated. It is a conventional construction method well understood by contractors. Waterproofing can be applied to the outside surface of the structure. The inside of the excavation is easily accessible for the construction equipment and the delivery, storage and placement of materials. Drainage systems can be installed outside the structure to water or divert it away from the structure. Somewhat larger footprint required for construction than for top-down construction. The ground surface can not be restored to its final condition until construction is complete. Requires temporary support or relocation of utilities. May require dewatering that could have adverse affects on surrounding infrastructure. With top-down construction in figure, the tunnel walls are constructed first, usually using slurry walls, although secant pile walls are also used. In this method the support of excavation is often the final structural tunnel walls. Secondary finishing walls are provided upon completion of the construction. Next the roof is constructed and tied into the support of excavation walls. The surface is then reinstated before the completion of the construction. The remainder of the excavation is completed under the protection of the top slab. Upon the completion of the excavation, the floor is completed and tied into the walls. The tunnel finishes are installed within the completed structure. For wider tunnels, temporary or permanent piles or wall elements are sometimes installed along the center of the proposed tunnel to reduce the span of the roof and floors of the tunnel. It allows early restoration of the ground surface above the tunnel The temporary support of excavation walls are used as the permanent structural walls. The structural slabs will act as internal bracing for the support of excavation thus reducing the amount of tie backs required It requires somewhat less width for the construction area. Easier construction of roof since it can be cast on prepared grade rather than using bottom forms. It may result in lower cost for the tunnel by the elimination of the separate, cast-in-place concrete walls within the excavation and reducing the need for tie backs and internal bracing. Inability to install external waterproofing outside the tunnel walls. More complicated connections for the roof, floor and base slabs. Risks that the exterior walls (or center columns) will exceed specified installation tolerances and extend within the neat line of the interior space. Access to the excavation is limited to the portals or through shafts through the roof. Limited spaces for excavation and construction of the bottom slab. It is difficult to generalize the use of a particular construction method since each project is unique and has any number of constraints and variables that should be evaluated when selecting a construction method. The following summary presents conditions that may make a one construction method more attractive than the other. This summary should be used in conjunction with a careful evaluation of all factors associated with a project to make a final determination of the construction method to be used. No requirement to limit sidewall deflections. No requirement for permanent restoration of surface. Sidewall deflections must be limited to protect adjacent features. Surface must be restored to permanent usable condition as soon as possible.